John Hagel walks us through how the ‘Big Shift’, driven by digital technology and a rapidly globalizing world, is driving unpredictable change at an ever increasing rate; and how the ‘Power of Narrative’ can help us create movements that let society benefit and thrive from the Shift. I have been studying and publishing about the Big Shift at Deloitte’s Centre for the Edge since 2007. We brought together a series of metrics around digital foundations and economic freedom; flows of knowledge, capital and people; together with the impact on value for institutions and individuals to measure and describe how things have changed over the last 50 years. What we are seeing in 2014 is that digital technologies are coming together into global technology infrastructures that straddle the globe and reach an ever-expanding portion of the population. In economic terms, these infrastructures systematically and substantially reduce barriers to entry and barriers to movement on a global scale. One effect of this is to accelerate the pace of change – information flows at a faster and faster pace to more and more nodes, making it possible for all of us to see things faster and to change our actions more quickly than ever before. As anyone who understands complexity theory knows, the more connected we become, the more vulnerable the system becomes to cascades of information and action that can disrupt the system in unexpected ways. While previous disruptive technologies have tended to stabilize we are not seeing that with digital technology. Our digital technology infrastructure is unprecedented in human history. It is not stabilizing. The core technology components – computing, storage and bandwidth – are continuing to improve in price/performance at accelerating rates and the best scientists and technologists suggest that this exponential pace will not slow down in the foreseeable future. And the power and scope of impact of these technologies is amplified by their interaction with each other and their ability to accelerate the performance improvement of an expanding array of other technologies. The rapid changes in both the digital technologies and the technologies and business models built on them is blurring traditional boundaries between industries and leading to disruptions that may span the economy. The Shift does have a dark side. As change continues to accelerate, uncertainty within our institutions grows and performance pressure mounts. Instead of harnessing the opportunity, we see too many institutions becoming more risk averse. It is as though Institutions are waiting for stability that may never come. It is important that institutions rethink their practices and structures to access the resources and talent they need to learn, adapt, and innovate in times of constant change. A useful resource is the Shift Index, and in this case – the Shift Index in Australia, which was compiled by Peter Evans Greenwood – the author of The New Instability. The Shift Index for Australia represents the first time the Centre for the Edge has compiled a Shift Index outside the US. While many things are the same, there are also marked differences. In the US we have seen a steady decline in Return on Assets, whereas in Australia we are seeing a steady increase. We are seeing increased competitive intensity in Australia over the long term but it is still a long way from the competitive intensity in the US. Returns to creative talent in Australia are lower than in the US which may have provided some insulation to Australian companies in terms of the financial returns they are able to generate. On a public policy front, Australia has seen ongoing reform over the last three decades such that it is ranked 3rd globally on the Economic Freedom Index. My second focus is on the Power of Narrative. As organizations and individuals experience increasing pressures and rapid changes, I believe that what we need is a new narrative: One that isn’t confined to a specific country, race or religion, but that highlights the incredible opportunity created by digital technology infrastructures on a global scale that are evolving at an exponential rate. One that focuses on the ability of each of us to achieve far more of our potential than we ever would have imagined possible and the opportunity to achieve even more when we come together on a global scale to learn faster than we ever could on our own. One that is clear about the challenges we will face as we seek to address this opportunity, but one that is also compelling about the abundance that will result as we overcome these challenges. One that helps us to find each other as we begin to gather on the edges of existing institutions and gain support from each other across multiple edges in different institutions and different parts of the world as we embark on this amazing quest. Everyone is captivated by the emotional power and engagement of stories, and it’s true, stories have enormous power. But to understand the much greater power of narrative, I point to the significance of narratives throughout history. Every successful social movement in history has been driven at its core by a narrative that drove people to do amazing things, even give their lives, whether it’s the Christian narrative, the American narrative or the Marxist narrative. Narratives have an extraordinary power of pull. Narratives are relevant at multiple levels – they can shape our lives, our institutions and the social arenas that surround us. Narratives are far more powerful than stories because they actively call for participation – they are open-ended, with the resolution hinging on the choices and actions that each of us will take in the days and years ahead. The outcome depends on us. What will we choose to do? Note: Silicon Valley based John will be visiting Melbourne on February 21 to share, explore and discuss how we, as individuals and through roles we may have in Institutions, can make the most of the extraordinary opportunity to turn stress into abundance. Get your tickets to John Hagel’s Melbourne Tour at Deloitte’s Center for The Edge here. Hagel will be joined at the event by Pete Williams and Pete Evans-Greenwood. 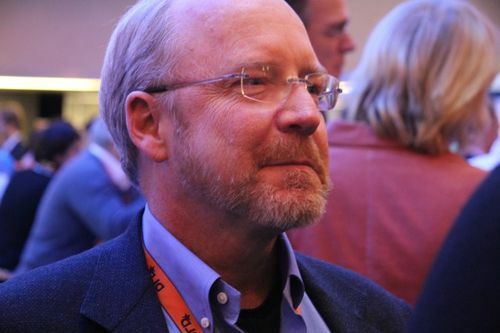 About our contributor // John Hagel is an author and former consultant who specializes in the intersection of business strategy and information technology. In 2007, Hagel founded the Deloitte Center for the Edge Innovation. Follow him on Twitter @jhagel.